Check out 10 chic and bespoke mehendi designs that speak of rich Indian traditions! Mehendi is not just a fashion rage internationally, but an important part of wedding celebrations and festivities. The mehendi is an auspicious symbol of love, and marriage. As per tradition, it is believed in India that the deeper the color left by mehendi, the more loved is the bride. Hence this custom of making mehendi designs on hands and feet is important for every Indian woman about to get married. 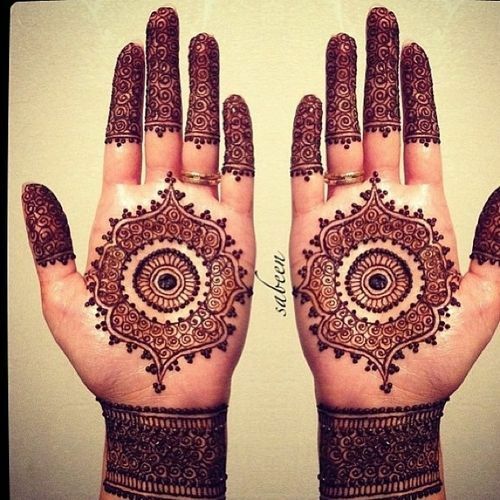 Traditionally, mehendi has always been of a great importance for an Indian bride. Apart from adding to a bride’s beauty, it also has a calming effect on the brides. 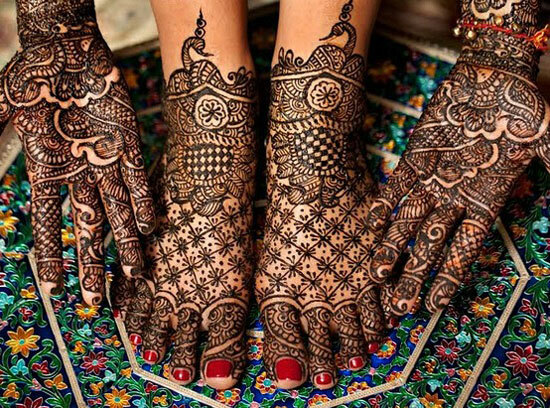 They say that when a bride is jittery and nervous before her marriage, the henna on her hands and feet help in soothing her nerves and thus make her comfortable and peaceful before the day of the wedding. Whether it is an intricate design, or something subtle, there is always a motif that the catches the eye of the to-be bride. In case you’re going heavy on the jewelry, it might be a good idea to cut down the clutter on your palms. There are numerous mehendi patterns that reflect tradition. If you love heavy intricately woven motifs, then Rajasthani mehendi designs are the best. The unique designs fill up the entire hands with floral patterns, peacocks, lace that are bold and prominent. Peacocks and lotuses are common occurrences when it comes to wedding mehendi even in Punjab and North India. The romantic significance and allusion that these designs give is unmistakable. Thematic mehendi designs are done according to the occasion. Especially for Indian brides who wear mehendi both on hands and feet thematic mehendi designs should be the first option. These designs feature a bride and grooms face in each hand, elephants and other symbols that is apt for a bride on her wedding. A bride’s moods and moments captured in her mehendi is by far the most beautiful design. A dancing bride, to a coy bride, to the one waiting for her lover is simply amazing. Such designs should have really delicate and minute details to give the best look to the bridal mehendi. Similarly, Mughal inspired mehendi is aesthetically beautiful and filled with intricate motifs. You can find that even the smallest design is detailed and visible. Just like the royal Mughals, era-inspired mehendi designs are also rich and classy. These designs have a flavor of traditions and are really charming and beautiful. Mughal mehendi designs are timeless classics which resemble the rich art and culture of the Mughals. This mehendi will give you a glamorous as well as graceful look. A king and a queen portrait perfectly represent the bride and the groom. Any bride would love to have the symbol of divine love on her hand. Imprints of Radha and Krishna playing raasleela or in their iconic pose with flute look really appealing. Of course, it is a bit difficult to draw this mehendi design, but the results are all worth the wait. In order to have a matching mehendi design on your feet, you can have either a peacock or paisley print. Images of gods and goddesses are ideally not drawn on the feet as a sign of respect. An elephant is the traditional Indian symbol of royalty and anything which is majestic and grand. In olden times, the king used to come on an elephant to the wedding venue. Thus, elephant design looks stunning as your mehendi design. Here are some ideas that you can ape for your big day.